The plan, (assuming I don’t get sidetracked on a million other things, which is what usually happens) is to do a major overhaul of the mod_rewrite documentation during the hackathon at ApacheCon. Please speak up if you have specific comments or recommendations. So far, the outline is something like this. 1) A couple of years ago, I split the “Rewrite Guide” into basic and advanced. This was ill-advised, and the division was stupid. Now it’s just harder to find stuff. Going to re-merge those, and then try to do a division based on topic, rather than difficulty, since that’s not a particularly useful concept. 3) Scrap the inscrutable examples. Both the guide and the formal docs are littered with examples that either never happen in the real world, or are done better using some of the built-in functionality of other modules like mod_alias and mod_dir. Scrap those examples entirely, rather than continuing to try to make then scrutable. 4) Rewrite Flags documentation. Started this years ago, and never really finished it. Also, needs to be updated to include the new flags that have been added in 2.2 and trunk. 6) A document about (so-called) S.E.O. uses of mod_rewrite, discussing both the techniques that can be used, and the misinformation that tends to drive the desire to use those techniques. This needs to be handled carefully, because there’s a tendency to simply state that all SEO is snake oil – which much of it is – and ignore the topic entirely. But, folks are going to do this stuff whether or not we approve, and it’s better if they do it well. At least, that’s what I think at this particular moment. 2c, above, is both about stuff that you shouldn’t do with mod_rewrite at all, and also some of the new features in 2.2 and trunk that make mod_rewrite unnecessary. It might also be handy, some day, to have a [DQS] flag that discards the query string explicitly, rather than having to do silly tricks to make it disappear. I don’t remember exactly when I started doing mod_rewrite stuff. I remember why. I noticed that more than half of the questions on #apache were about mod_rewrite, and I made a decision to become the expert on it. I was already very familiar with regular expressions, since I was a Perl programmer at the time, so I figured it couldn’t be very difficult. I determined pretty early on that the biggest difficulty with mod_rewrite was that people were afraid of it. In particular, they were afraid of regular expressions. And there’s plenty of things floating about reinforcing this fear, not least of which is the mod_rewrite documentation itself. 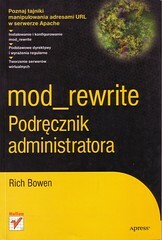 So, now, several years on, I have a book about mod_rewrite, and in about 10 minutes I’ll be giving Yet Another conference presentation about mod_rewrite, which is nothing more than an affirmation that this isn’t hard (after all, I mastered it) but that there’s still a lot of people who need help with it. You’ve got just 2 more days to send in your paper proposal for ApacheCon Amsterdam. Lars extended the CFP through Friday. Hurry, hurry!